Phantoms are not the only city team with a big weekend ahead. The Peterborough Islanders compete in the National League Division Two South Cup finals in Oxford. They take on Basingstoke in a Saturday semi-final with the winners of that clash going on to face either Slough or Chelmsford in the final on Sunday. And Islanders coach Stevie Johnson is hopeful of a strong challenge for the silverware. 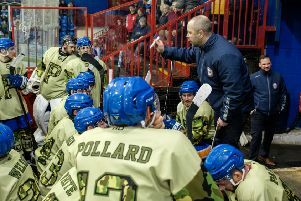 Islanders warmed up for their finals weekend by ending the 100 per cent record of East Division champions Slough in their last match of the regular season last Saturday. They delivered dominant displays in the first and third periods to secure a 9-3 success with Nathan Pollard, Connor Stokes and Shaun Yardley all striking twice. James White, Conor Pollard and Connor Hunter were the other players to find the net.